Without a true point guard, Justin Mason and the Horns have struggled this season. It is amazing how far the men’s basketball program has come under the guidance of [tag]Rick Barnes[/tag]. 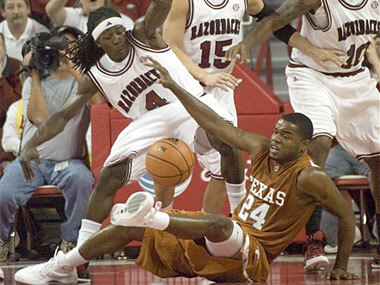 Texas basketball used to be an afterthought, something watched to help get over not having anymore football. Now, the Longhorns are perennial conference championship contenders and recruit the kind of talent that brings home national awards. 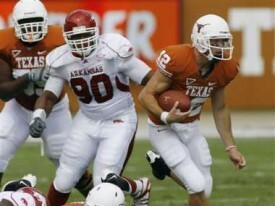 A decade and a half ago would [tag]Kevin Durant[/tag] ever think about attending The University of Texas? With the success comes expectations, and with the bar that has been set it has to be said that this year’s team has underwhelmed many. The defense while great at times is hard to play for 40 minutes every time out, Damion James has had a harder time adjusting to the wing than expected, and the late minute offense has been inept. But the one thing that is holding this team back over all else is not having a true point guard. College basketball is a guard dominated sport because of the zone defenses and shorter three-point line. The Longhorns have been spoiled in recent memory with the likes of [tag]TJ Ford[/tag], [tag]Daniel Gibson[/tag], and [tag]DJ Augustin[/tag]. [tag]Justin Mason[/tag] is a solid player, a great defender, and a hell of a young man. What he is not is a true point guard. All three Longhorn losses ([tag]Notre Dame[/tag], [tag]Michigan State[/tag], [tag]Arkansas[/tag]) have all been decided in the last minute. In all of those losses except maybe Notre Dame, the lack of a fluid play set has denied the team from getting up efficient shots. Too many times when they need it the most the ball is lost out of bounds or a shot is jacked up after too much one-on-one dribbling. Unfortunately [tag]AJ Abrams[/tag] is not the answer. Unfortunately a true answer does not exist on the current roster. It doesn’t mean Texas can’t make some noise in March, but it does mean that Longhorn nation is going to be very frustrated with this team at times during conference play. Rick Barnes is an excellent coach with a proven record of coaching teams that improve as the season goes on. On top of that guys like Mason and Abrams want to win and want to prove to the world that they can get it done. The mix is there for success, just not the kind of success that the newly spoiled Texas fans are looking for. No upsets mean not much movement within the top of the rankings this week. [tag]Alabama[/tag] looked shaky and almost went down but otherwise just [tag]South Florida[/tag] suffered a loss. The Oklahoma Sooners won impressively and picked up additional first place votes heading into their match-up against the good guys. The Longhorns stayed at number five in both polls but did lose a few points in the USA Today Coaches Poll, despite easily handling a solid conference opponent. Texas quarterback is up for the ESPN All American Player of the Week award for his week five performance against [tag]Arkansas[/tag]. McCoy was 17 of 19 passing with three touchdowns while adding another 84 yards and two scores on the ground. He’s up against [tag]Oklahoma[/tag] QB Sam Bradford, Alabama’s John Parker Wilson, and Oregon State’s Jacquizz Rodgers. UT’s own Colt McCoy is up nominated for AT&T and ESPN’s All American Player of the Week this week. The other three players, chosen by ESPN based on their outstanding performance, include Sam Bradford (QB, Oklahoma), Jacquizz Rodgers (RB, Oregon State), and John Parker Wilson (QB, Alabama). It’s up to fans to now vote for the winner – and after McCoy’s performance, he deserves to win! Register to vote by texting “VOTE” to “51234” before Wednesday at 11:59 pm EST. 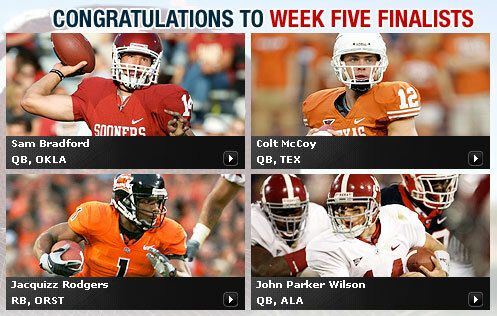 The winner will be announced at halftime of the Thursday ESPN College Football Primetime. Anyone who votes is entered for a chance to win a trip to the 2009 BCS National Championship game in Miami. Each vote counts as one entry & there is no limit on fan voting. Also, stay in touch with the Longhorns by texting “Horns” to 72645 – you’ll receive text alerts with game day reminders and the latest team statistics, updates and news for all 20 Longhorn sports. You’ll also be able to test your Longhorn knowledge with polls. Compete for a chance to win Longhorn football tickets! Thanks to upsets losses by USC, [tag]Georgia[/tag], and [tag]Florida[/tag] the Longhorns have vaulted into the top five of both the AP and USA Today Coaches polls. [tag]Alabama[/tag] flew past the Horns after their win over the UGA but the easy win over [tag]Arkansas[/tag] was enough to move Texas up to spots to the number five ranking. Texas is relatively comfortably ahead of [tag]Penn State[/tag] in both polls, but rankings this week don’t matter much as Texas will prove itself over the next three weeks when they face [tag]Oklahoma[/tag] and [tag]Missouri[/tag] in consecutive games. Senior fullback [tag]Luke Tiemann[/tag] is done for the year after tearing the ACL in his left knee during the Texas win over [tag]Arkansas[/tag]. Despite scholarship offers from other Division 1A schools, the young man out of Pflugerville decided to walk on at Texas. Tiemann started games at fullback during both his sophomore and junior seasons while also spending time at defensive end and contributing on special teams. His efforts earned him a scholarship before the beginning of this season. Longhorn senior fullback Luke Tiemann sustained an anterior cruciate ligament (ACL) tear in his left knee in Texas’ 52-10 victory over Arkansas on Saturday, and will require season-ending surgery, UT Head Athletic Trainer for Football Kenny Boyd confirmed Sunday. Tiemann is a fifth-year fullback who has also played defensive end and contributed on special teams during his 34-game career. He began his career as a walk-on and earned a scholarship in August 2008 after making the switch to fullback midway through 2006. He had played in all four games in 2008. In 2007, Tiemann saw action in 11 games, including one start, at fullback and on special teams. He played in all 13 games at fullback and on special teams in 2006 and also saw limited action on defense at linebacker. The Pflugerville native is a 2007 first-team Academic All-Big 12 selection and a six-time member of UT’s Athletics Director’s Honor Roll. Get well soon Luke! Hook ’em! 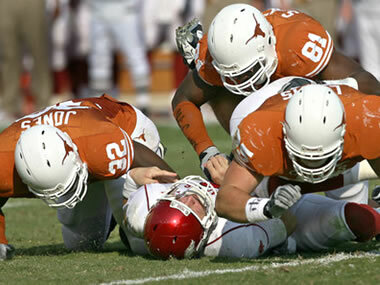 The Longhorns played their most complete game of the season in Saturday’s 52 – 10 thrashing of former SWC foe [tag]Arkansas[/tag]. The offense was sharp from the very first snap of the game and the defense dominated their SEC opponent. The victory was one of the most lopsided in the series’ long and storied history.